Hollis Easter Creations handmade jewelry holiday sale! 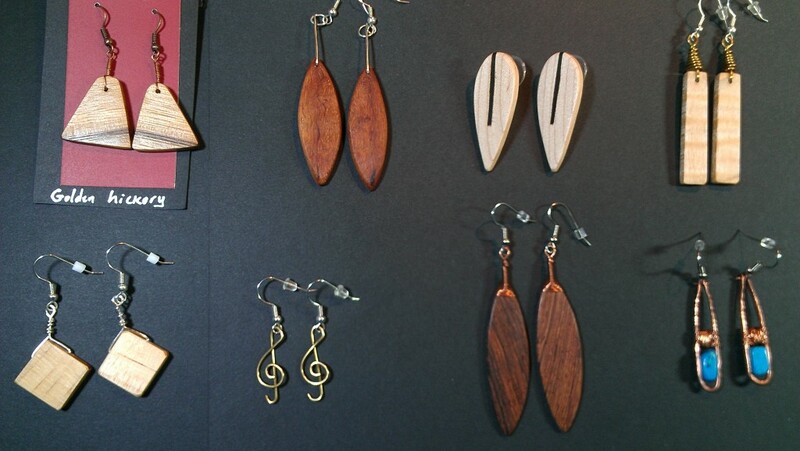 I make and sell jewelry, most of it from reclaimed hardwoods that would otherwise be burned or thrown away. I love working to find the beauty and spirit hidden inside chunks of wood. 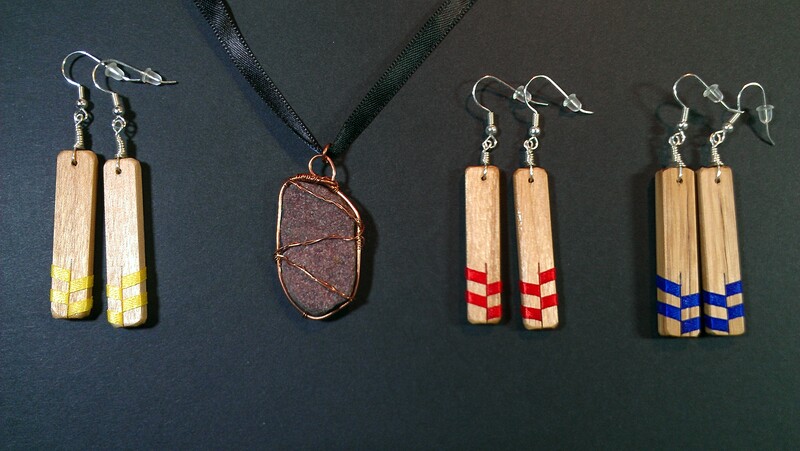 With bandsaw, scroll saw, sanders, drills, polishes, and more, I make wearable art with a natural beauty. My workspace got flooded in the spring, so I haven’t produced much new work in a while. I want to sell off my back-stock of jewelry so I’ll have room to make more! If you’re looking for something one-of-a-kind for Christmas, here it is. I particularly love wood that has a story behind it. Many of these pieces started as scraps from luthiers or heirloom cabinetmakers: hunks of wood that were too small for them to use, destined for a burn barrel. Others, like the Montpelier maple ones near the bottom, have a history of use: those are made from reclaimed floorboards from the Montpelier, VT Capitol City Grange, where generations of contra dancers pounded the floor for 53 years before the floor was replaced in 2012. Allergy information: most of these earrings are made with silver-plated brass earwires, and I’ve had good reports from people with metal allergies. That said, everyone’s allergies are different. I can also supply sterling silver, surgical steel, or niobium earwires for a small additional fee. I can also convert most of these earrings to steel clips or sterling silver adjustable earscrews. If you have questions, please ask! I will update this page as items get sold. More detailed information on each pair (including materials, size, weight, metals used, and interesting factoids) is available at Hollis Easter Creations on Facebook. 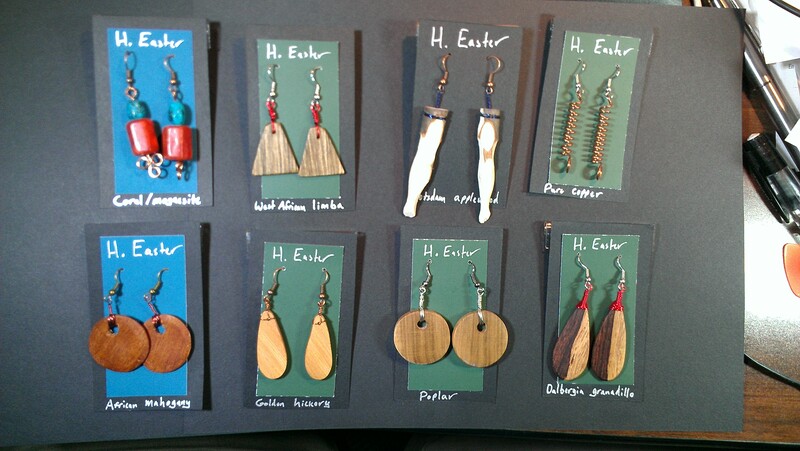 Go to Hollis Easter Creations on Facebook, Like the page, and send me a message saying which earrings you’d like. Send me an email (firstname lastname at gmail.com) saying which earrings you’d like. I’ll reply and let you know whether they’re still available. If you live in NY, I have to charge sales tax. Shipping and handling is $5 for US First Class Parcel with tracking (3-5 days), and I’m happy to combine shipping for multiple orders. Once we talk and confirm that your jewelry is still available, I’ll send you a PayPal invoice or give you my address and ask you to mail me a check. I’ll ship as soon as I receive confirmation of payment, and I’ll email you the tracking number for your shipment. Due to a backlog in the queue, I’m not taking new custom orders at this time.